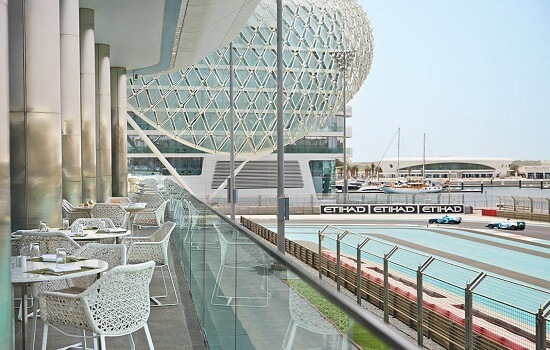 The Yas Hotel is Yas Island Abu Dhabis premier 5 star hotel. 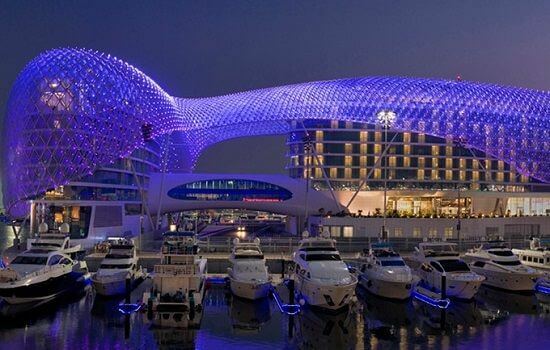 The interiors of the hotel embody a contemporary fusion of elegance and momentum, created with sensuous curves and sleek lines and with its incredible LED canopy that emits a concert of colour, defining the Abu Dhabi hotel as a landmark across Yas Island and one of the worlds most extraordinary race destinations. Experience the pure comfort, plush amenities and latest in technology that features in all 499 of the generous guest rooms and suites. Delight in 11 innovative dining and lounge venues. From lavish Mediterranean choices and house-made Italian pasta to Southeast Asian specialties and Japanese Teppan, the freshest seafood and sushi to regional Indian cuisine and to light snacks at our rooftop infinity pool. Plus a stylish array of bars and lounges. Enter a sanctuary of award winning rejuvenation at ESPA Spa, where classic healing traditions blend with modern techniques to provide an inspirational experience. Through a detailed offering of spa treatments, each guest will find a tranquil retreat for pampering and relaxation, emerging with a renewed energy and spirit.